People live in a new world, full of high technological and scientific products, on the one hand, people enjoy the convenience and ease the crystallization of human's hard work brings, on the other hand, the electronic office procedures trap people into the comfortable situation, so they don't even want to step out of their house, then the symptoms such as swirl, headache, weakness caused by lack of exercise will come one by one. 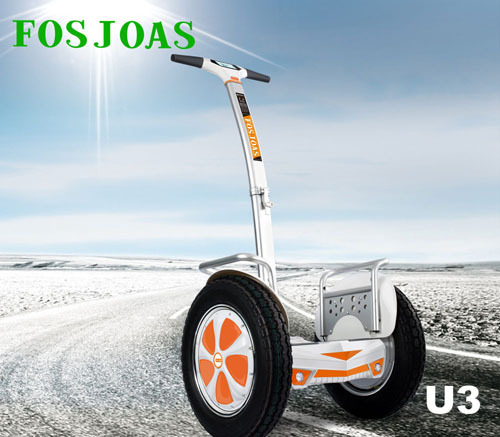 Fosjoas two-wheel electric scooters U3 was born to improve the present situation and arouse people's interest to touch with nature. Firstly, the unique way of riding opens people's minds and eyes so that they prefer trying this riding way than common walking. The design of riding way of Fosjoas two-wheeled self-balancing scooter U3 is not just for fun, at the same time, the riding of leaning forward or backward to accelerate or stop the scooter which seems a little strange can exercise the whole body, time will tell people the truth that more exercises, much healthier. Besides the basic function of transport, Fosjoas electric self-balancing scooter owns the characteristic of off-road riding and has another name of SUV scooter, with the improvement and the higher properties that adapt to any terrain, the intelligent chips is updated, CPU is upgraded, the driving force is much stronger. The hub is also an important element for the off-road scooter, Fosjoas two-wheel electric self-balancing scooter U3 uses Cheng Shin tire with unique tread pattern of 16-inch, the bigger size helps riders ride more steadily and smoothly and special quality helps drain water, dissipate heat and enhance grip performance, generally speaking, it ensures the safety of riders and longer service life itself at the same time. When people reach the top of the mountain and look around, they may find the excellence cannot be expressed by any word, the beauty cannot be found on any website, the scenes are real and not on the screen. Gradually, people will realize that the strange symptoms all disappear, only the good mood and health leave.